The first time I went to Disneyland was back in 1964 and my most vivid memory of the whole trip was walking through "The Home that Chemistry Built” in Tomorrowland, marveling at pushbutton telephones, sleek modular furniture, and kitchen cabinets that slid down from the ceiling. I was only ten years old at the time, but the exhibit clearly had an impact on me because for the first time ever, I dared to contemplate what the world would be like in the future. As I sat there with my mom and sisters on those bizarre molded Lucite chairs in the Tomorrowland courtyard doing all this forward thinking while I waited for my grandmother to buy postcards in the gift shop, I felt certain that by the end of the century we'd all be darting around in flying cars, and that robots would be making our beds and cleaning up our kitchens (the two chores I hated most as a kid.) Oddly enough, the one thing that never crossed my mind was that someday I'd return to Disney – not only with my own children, but even with my grandchildren! As of a few weeks ago I have now done just that. (I also went once with my church choir back when I was in high school too, but at that point "the Magic of Disney” was more about sneaking a kiss from my boyfriend during the "It's a Small World” ride than anything else, so I really don't count that one.) My role on each visit has been different, and so, consequently, has been the experience. As a kid my only job was to have fun. Period. 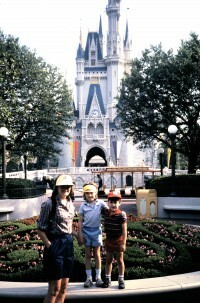 In 1983 my husband and I took our children to Disney World. Lauren was five years old at the time, and Jason was only three. On that trip, as a mother it was up to me to monitor the sugar intake; to gauge when it was time to go back to the hotel for a nap before returning to the park for nighttime fireworks; to assess which rides were appropriate for which kid; to wear the backpack containing the snacks, caps, camera, sunscreen, maps and souvenirs; and to keep track of everybody's whereabouts. (My only slipup on this last one was in Frontierland when I momentarily lost track of Jason. In that split second he decided to try out a stockade, which would have been fine had he not chosen to poke his head through one of the arm holes, where he immediately got stuck. His high-pitched shrieks quickly drew a crowd who thought I had deliberately put him there. By the time we finally managed to dislodge his noggin, an angry mob was ready to lock me up!) Was it an enjoyable Disney trip? Yes, but hardly a relaxing one. Fast-forward almost three decades. Now I was the grandmother and this time my only job was to revel in Aidan and Avery's reaction to everything. It was my daughter's responsibility to be the pack mule and the hall monitor. But she had an ace in the hole – or more accurately, an app in the iPhone. With a gadget the "Imagineers" of 1960s Tomorrowland could never have envisioned Lauren was able to track the wait time for every ride in the park and even purchase Fast Passes at the touch of a button. Over the course of four days I was constantly in awe at how much technology had streamlined the whole process. And yet, the more things had changed the more they stayed the same. Minnie Mouse still wore the same dress that doesn't match her shoes. Our guide still told the same hokey jokes on the Jungle Ride. The parents' bedroom at the top of the Swiss Family Robinson Tree House still offered the best view of the whole park. The kids were still completely exhausted by mid-afternoon. And yes, I still managed to sneak a kiss (this time from my hubby) during the "It's a Small World” ride. 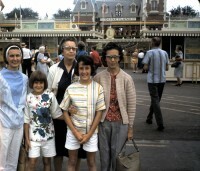 The first time I visited the Magic Kingdom I was with my parents and my grandmother (whose favorite attraction, believe it or not, was "The Hall of Presidents" – yawn!) Forty-seven years later I came with my daughter and my grandchildren, which means that I've now seen Disney through the eyes of five generations! By golly, Walt, you were right. You were absolutely right. Search for See the USA! articles similar to "Still the Happiest Place on Earth!. Search all articles similar to "Still the Happiest Place on Earth!". List all See the USA! articles.